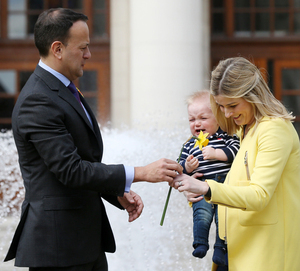 Taoiseach Leo Varadkar upsets Sean (aged 9 months) for no discernible reason at the launch for ‘a call of support’ on Daffodil Day (March 22) with Chief Executive of the Irish Cancer Society Avril Power in attendance. Posted in Misc and tagged Daffodil Day, Narcissus at 4:28 pm on March 20, 2019 by Bodger. She’s perfected the Trump combover, it seems. …in a Rossie cheerleader outfit? 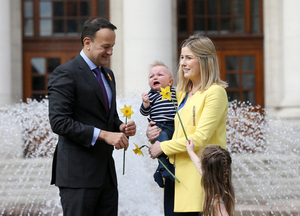 Ah, that’s a bit mean, just look at the €140,000 smile on her, ‘twould charm the €19 million out of the taxpayer and others that the Cancer Society gets on top of the €3million they collect from the daffodil lark (if the cynicism isn’t shining through clearly enough, I believe the services provided by the Cancer Society could be provided more efficiently and cheaply by the HSE). 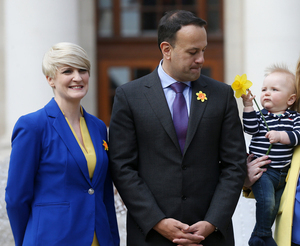 That’s the overstaffed and consistently over spending HSE? They have very nice offices..
Like a young Kian Egan. Fair play Bodger, that gave me a chuckle. That’s what I thought initially but it looks like his Mum nabbed it. 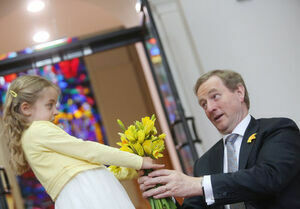 Another failed politician nesting in the charity sector. 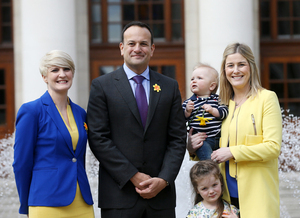 Coming to a NCH Board near you ….. Remind me again what the ICS do? Yes, I read their website and mission statement. 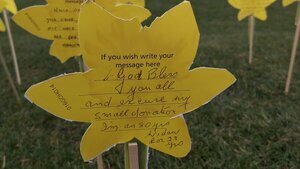 But when a family member rang them in crisis after a diagnosis of cancer (which turned out to be terminal) they didn’t really have much to say and definitely couldn’t/wouldn’t provide anything more than platitudes and information that is freely available everywhere. More likely they exist to exist and pay a select few a tidy sum in the mean time. I’ve heard that a few times alright. 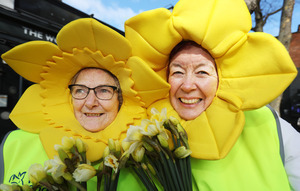 Apart from Daffodil Day, I’ve no idea what they do in real terms. Just don’t, if you have actual cancer, bother them while they are having such a great time.